Home PREGNANCY HEALTH Pregnancy Weight Gain What Should Your Normal Or Average Weight Gain During Pregnancy? What Should Your Normal Or Average Weight Gain During Pregnancy? Average weight gain during pregnancy is determined by your existing BMI before you get pregnant; however the average weight gain during pregnancy, as recommended for a healthy pregnancy is 11 kilos. There are some really major changes that take place in a woman’s body during pregnancy, and for a number of different reasons, there will be a certain amount of weight gained – the growing uterus, breasts, the placenta, extra fluid and extra blood volume, the amniotic fluid, increased fat stores all contribute to weight gain. This totals to the average weight gain during pregnancy; of about 11 kilos. Being overweight, or gaining too much weight during pregnancy has been linked to a number of health problems and pregnancy complications for the mother as well as her baby. The chances of the mother remaining obese ever after the delivery are higher and even the chances of the baby being born larger, and growing up to be a fat child and adult are increased. Pregnancy complications, such as gestational diabetes, high blood pressure or preeclampsia, more aches and pains, varicose veins, getting tired easily can also increase if a woman has more than average weight gain during pregnancy. So what should an overweight woman do then? Should she diet or restrict calories during pregnancy so as not to put on too much weight? Research has shown that this does not help in reducing chances of pregnancy complications. And it is also important to eat enough during pregnancy, a well balanced, varied and nutritious diet. And the best thing to do is to lose weight before getting pregnant and to try and come down to a normal weight before conceiving so that you can have normal weight gain during pregnancy. The same applies to women who are underweight. Rather than aim for more than normal weight gain during pregnancy, it is best to reach normal or ideal weight before getting pregnant. 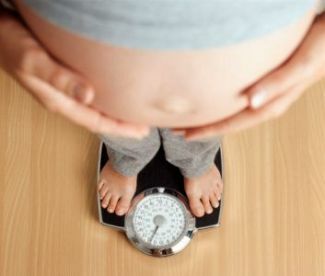 This is because being underweight is also associated with certain pregnancy problems – there is the risk of the baby being born too small, which is also associated with certain problems. So try and start your pregnancy at a healthy weight and then aim for about 11 kilos of weight gain, which is an average weight gain during pregnancy.